Intel's OPS (Open Pluggable Specification) offers a universal embedded interface which offers a link to external media players with large video displays.This provides users with integration options for their signage and conferencing applications. With Winmates OPS Solution Digital Signage, it simplifies interoperability and application upgrades designed to meet the digital signage requirements of individual customers. Winmate created an All-In-One Signage Display that combines 21.5", 24", 42", and 55" monitors with a pluggable computing module that acts as a digital signage player, this new OPS module comes with Intel’s next generation Haswell 1.6 GHz (Turbo Max. 2.6 GHz) processor paired with genuine Intel graphics resulting in a high performance system capable of running signage and multimedia applications. 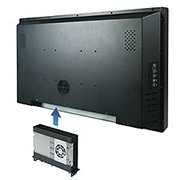 Winmate has announced 3 different CPUs of OPS Digital Signage in 4 different panel sizes.Customers can swap in pluggable entry-level, mainstream or high-end modules to satisfy their different needs.Customers can choose between any of the OPS displays (21.5", 24", 42" and 55") and insert any one of OPS modules (OMIH, OMIS, OMID) to make a custom digital sign to fit their needs. Model Name 21.5" 24" 42" 55"